The Continuomat continuous motion assembly machine is designed for high volumes of products at up to 750 cycles per minute. This high-end continuous motion machine is usually supplied for the cosmetics and medical industry where high quality and reliable assembly are required at all times. Assembling product parts at a high speed only becomes effective only if the operation efficiency is high. That is why one of our main aim is to supply machines that are highly reliable. 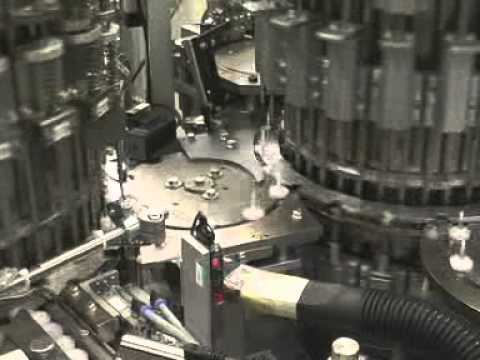 Our Continuomat continuous motion machine can assemble components at the speed of 1000 parts per minute for aerosol valves, dispensing pumps, cannulas and other small components as well. We are able to handle springs that have been cleaned in citrus acid and crimp continuously using either a proprietary system or our own mechanical crimping mechanism. The mechanism of the machine is very simple, however efficient by using CAM control. Transfer of components onto the main machine turret takes place using specially designed transfer wheels. We also supply continuous motion function testers at high speed, designed to your specific product.